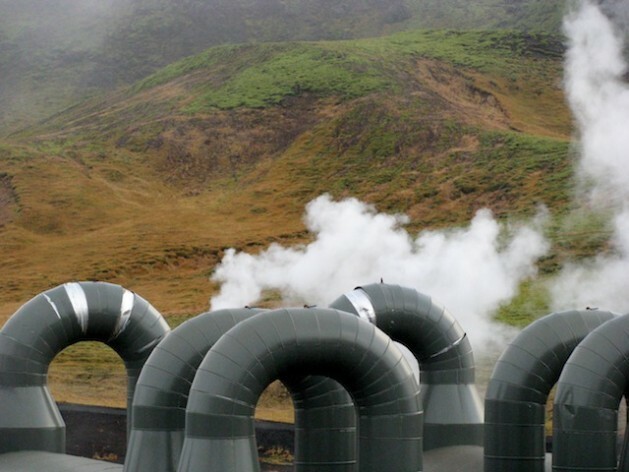 The Hellisheidi geothermal power plant in Iceland that may provide energy to Britain. Credit: Lowana Veal/IPS. REYKJAVIK, Jun 5 2012 (IPS) - With rising energy prices and stringent requirements for producing a higher proportion of energy from renewable sources in the near future, long-distance electricity cables are increasingly thought of as a viable option for providing electricity. The cables, or interconnectors to give them their proper name, transmit energy by way of High Voltage Direct Current (HVDC) rather than the conventional Alternating Current (AC). For long-distance connections, HVDC cables are highly energy efficient, losing only 2-3 percent of power over 1,000 km. Now, UK Energy Minister Charles Hendry is undergoing discussions with Iceland’s state-owned energy company, Landsvirkjun, on the possibility of setting up an underwater cable between the two countries to provide Britain with renewable energy from Iceland. The energy would come from existing geothermal and hydroelectric power plants, although if the two pilot windmills which are scheduled to be installed later this year prove successful, wind power could also potentially be used to power the interconnector. Landsvirkjun has in fact been exploring the possibility of setting up an underwater cable with Europe since the early 1990s or even before, but the cost has always been thought of as prohibitive although the initiative was always known to be technically feasible. The cables would lie at a depth of about 1000 m while the distance between the two countries is around 1,200 km. Other interconnectors exist that are longer or deeper, but none are both as deep and as long as the proposed cable linking the UK with Iceland. What is the next step? “The government has set up a committee to look at the economic benefits for Iceland,” says Magnus Bjarnason from Landsvirkjun. Asked whether more power plants would need to be built to power the interconnector, Bjarnason replies: “Technological advances have enabled energy distribution to become more efficient. In all such systems, there has to be enough excess capacity to deal with power failures or other emergencies. “It all boils down to reducing waste in the system,” he concluded. Some Icelanders are wary of the proposed interconnector, though. At a recent gathering of conservation organisations, participants said that environmental impacts had not been considered at all. The forum concluded that investigating such impacts should be prioritised and information should be made available before other components of the matter are looked at. “The proposed cables would put pressure on building more power plants, both hydro and geothermal, for exporting energy. These are often located in sensitive wilderness areas which we want to protect. “In addition, the Icelandic power transmission system would need much bigger transmission lines with associated visual and other environmental impacts to connect to the undersea cables,” explains Gudmundur Ingi Gudbrandsson from Landvernd environmental association. Gudbrandsson also points out that little has been done to investigate the environmental impact of windmills in Iceland. Interconnectors are not a new discovery. Britain already has undersea interconnectors that link to the Netherlands and France, and interconnectors that will link the UK with Belgium, Norway and Denmark are being considered. Hydropower will be used in the Norwegian case, but wind power will provide energy from Denmark. The German-led Desertec venture aims to harness renewable energy from deserts and transport it via HVDC to areas in need. It is an ambitious project and has already started up initiatives in Morocco, Tunisia and Egypt, although the foundation says that deserts can be utilised anywhere. Concentrated solar power (CSP) will be the main source of energy for Desertec projects, but wind and other technologies will also be used. In Morocco, a 500 MW CSP complex composed of 12 square kilometres of parabolic solar panels is being built in Ouarzazate. Most of the energy will probably be used by Morocco itself, but the excess will be exported to Spain via an undersea interconnector. The first 160 MW is expected to go online in 2014. In Tunisia, the TuNur solar project will supply energy to Italy via an undersea interconnector by 2016, while in Egypt a huge wind farm will be set up at Gulf of el Zayt on the Red Sea and a solar and natural gas plant is already producing electricity from Kuraymat, about 100 km south of Cairo. But like the Moroccan case, it is the locals who get first use of the energy. In Europe, a project similar to Desertec has just been announced. Called Norstec, it consists of 20 companies in the energy business which will make use of the North Sea’s renewable resources, mainly offshore wind. The interconnector that might lie between the UK and Denmark would be part of this grid. Further details will be discussed at the Renewable UK conference on global offshore wind this month. With the help of interconnectors, renewable energy targets for 2020 and 2050 could become a reality. What do academics in the field think? “In general I think these interconnectors are a good idea, enabling renewable electricity surpluses and deficits to be balanced out over a very wide area and reducing the need for backup/storage,” says Godfrey Boyle, renewable energy professor at the UK’s Open University.